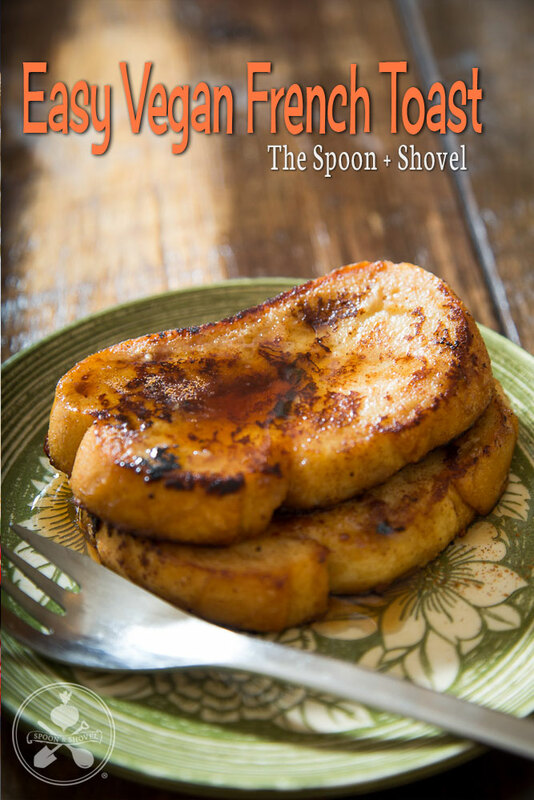 Snowy winter mornings are the perfect time for some easy vegan French toast! I’ve been trying to put together a foolproof, simple recipe for some time now, and hopefully this one becomes as indispensable for you as it has become for me. -Whisk together milk, vinegar, nutritional yeast, salt, vanilla, cinnamon and flour/starch in a wide bowl or deep-lipped plate until there are no visible lumps. -Heat a large skillet or frying pan on medium-high heat. When warm, add 1-2 T. butter and melt. -Soak each slice of bread on one side, then the other, then gently add to the hot buttered pan. -Fry on each side for roughly 2-3 minutes or until golden brown. Remove from pan, add butter and maple syrup, and serve. This recipe was a long time coming... We'd been missing omelette breakfasts for years and I had struck out with previous iterations of this general idea, but with a bit more vegan cooking technique under my belt, I finally feel like this recipe is ready to be shared. A little finesse is needed to keep these omelettes from breaking when it comes time to fold them over, so this may be a “practice before the party” sort of thing. This is a more advanced recipe than usual strictly due to the fragility of the omelette during cooking, but don't let that deter you - soon, your vegan brunch game will be second to none! *note, these were the fillings I used for this post, but you can fill yours with whatever you’d like. Sautéed mushrooms, bell peppers, sundried tomato, fresh basil, coconut bacon – there are tons of possibilities. -If making caramelized onions, start them first; slice an onion into thin strips and place in a pan with 1-2 T. oil (olive or avocado, preferably) and cook on medium to medium-high, stirring often. Be careful the heat isn’t too high, as you can burn your onions before they begin to caramelize. -If you don’t have cashew cream ready, follow the directions at the link above to make a batch; you will only need a ½ C. so you can freeze the rest for later (or have vegan alfredo for dinner tonight). -Add silken tofu, cashew cream, nutritional yeast, flour, starch and turmeric to a food processor and combine. -Add salt and pepper to taste, combine, taste again and repeat as needed. -Add the kala namak and combine; make sure you don’t overdo it with this ingredient, which gives a sulfurous, eggy flavor to the mixture. A little goes a long way. -Heat 2 T. oil on medium-high in a nonstick pan at least 8” in diameter. If you'd like, you can use the same pan used for the caramelized onions. -Scoop just enough of the tofu mixture into the pan so there is a thin layer on the base of the pan. 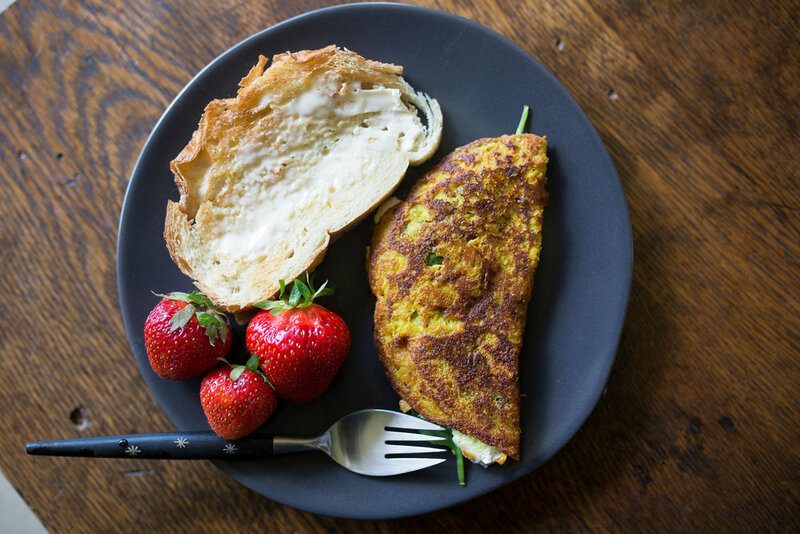 Smooth out with a spatula or spoon so that the mixture is even and not too thick; too much and the inside of your omelette will be runny and folding will be very difficult. -Cook for 2-3min, scraping edging gently so they don’t stick to the pan. Air pockets should form and be deflated gently as the mixture cooks, and the omelette will look similar to how pancakes cook. Check under the edges to make sure you’re not burning and adjust cook temperature accordingly. -When the omelette has become a darker color on top and appears sturdy when a spatula is gently inserted under one side, add your filling, cheeses first, and fold (again, gently) over. Remove from heat and let the cheeses melt and spinach wilt for a few moments, then transfer to a plate and repeat as necessary. -If you don’t use all of the tofu mixture immediately, it can be refrigerated for a day and cooked as your next breakfast, though it seems to begin separating after that, and freezing would damage the emulsion. It's mid-March, and of course the last of the winter snow has arrived. It's the perfect day (or evening) to make this flavorful vegan soup to warm you up and keep away any remaining cold weather blues. Packed with fresh turmeric and ginger, and paired with the refreshing snap and taste of bok choy, this is our household's go-to when the sniffles and aches start, and is one of the most no-fail recipes I have. Enjoy, and think spring thoughts! -Heat a stockpot on the stove on medium and add the coconut oil. -Chop and add the onions to the pot. -Chop and add the mushrooms; cook until the onions are translucent (4-6min). -Add the sea salt and ground pepper and stir. -Add the veg stock and water, and increase the heat to medium-high. -In a separate pot, bring water to a boil and cook the udon noodles. -Remove the skin from the turmeric and ginger, and chop the ginger. -Add the ginger, then grate the turmeric into the pot. -Chop the bok choy, leaving greenery intact where possible. -Add the bok choy and liquid aminos to the pot and let soup come to a low boil for a minute before removing from heat. -When udon is ready, strain off the water and add noodles to the soup. -Add the coconut milk and stir. Taste to see if the broth needs more salt or pepper and adjust to your preference. -Ladle soup into bowls, garnish with lime wedges and shake shichimi on top to taste. Squeeze lime juice over the soup before eating. Things were quiet on S+S for most of last year, with Meghan and I shooting weddings, solo guitar gigs for me, and a lot of general life eating into recipe time outside of work hours. One free night last summer, I came home late to an amazing quesadilla made by Meghan, and I was able to get a recipe annotated recently while she rushed around the kitchen making them for us. I can't take credit for any of this deliciousness except for helping make it disappear whenever Meghan cooks them! -Melt the butter in a large skillet on medium heat. -Drain jackfruit in a colander. -Chop onion and green chili. -Add onions to the butter in the skillet and sauté until translucent, 3-5min. -Add jackfruit and chili to skillet and toss to coat with onions and butter. -Stir continuously as you add the cumin, onion powder, paprika, liquid smoke, and ½ C. veg stock. Cook for ~5 min. -Add nutritional yeast and turn heat to high. -Add apple cider vinegar and liquid aminos, stirring continuously as liquid is absorbed and cooks off. Add more veg stock and nutritional yeast 1 T. at a time as jackfruit cooks. -Using a wooden spoon or firm spatula, begin pulling apart the jackfruit. It should be getting tender at this point and fall apart easily. -Once the jackfruit is mostly shredded, the majority of the liquid should be cooked off, and the jackfruit should be very tender and resemble pulled chicken. -Remove skillet from heat, then put a large, clean pan or skillet on the heat (medium-high) and add veg oil. -Spread a bit of mayo on one side of each tortilla, then place one mayo side up in the oil. Spread enough of the jackfruit to evenly cover the tortilla, sprinkle some cheese shreds on it, and place a second tortilla mayo side down on top. -Fry for ~1min on each side, or until lightly browned, flipping to brown top and bottom. Repeat with the remaining tortillas and jackfruit. I’ve been harping on this for a while now, but eating vegan isn’t more expensive than traditional meat and dairy-heavy diets (unless you’re getting prepared foods and meat alternatives every time you hit the grocery store… maybe). I wanted to make a concrete example, though, so here’s a pretty straightforward recipe for make-ahead burritos that can be frozen and heated up later. I try to keep a couple in the freezer for our breakfasts or if we need a quick to-go meal. This is just a rough template for pan-fried burritos, so feel free to swap out ingredients and try different combinations of fillings; shortly after making the batch described here, I made another batch with southwestern tofu scramble and crumbled veggie sausage. It’s hard to go wrong with these! *Ingredient costs here are estimates based on general price and one-off purchases. These burritos probably cost less to make than shown here, as a bag of onions is cheaper than one single onion, and spices are very cheap. Additionally, I made the seitan for these from scratch (recipe here), which cut down on price significantly for me, but my estimated cost is closer to that of premade seitan. *there are GF tortillas available, but I'm not sure which types are the most durable/least likely to rip during rolling. -Prep squash by halving and scooping out seeds; lay face down in a lipped baking pan or dish with a bit of butter inside and some water in the base of the pan. Bake at 400 for ~30 min or until pressing on the exposed skin gives a bit (indicating the squash meat is tender). Remove from oven and let cool. -Prep onions and peppers, drain beans, and prepare seitan (if using). -Add spices to a large skillet or frying pan and brown on medium heat for ~2 min, being careful not to let them burn. -Add onions and 1 T. of cooking oil to the pan; sauté on medium heat until translucent, 3-5 min. -Add peppers and sauté for another 2-3 min. -Add beans, corn and seitan to peppers and onions, toss to combine and cook on medium-high heat for 5-8 min, stirring regularly. -While the filling cooks, cube the squash. -In another large pan, heat the vegetable oil on medium-high. -Add squash to the rest of the filling, toss and remove from heat. -Spoon a heaping cup’s worth of filling onto your first tortilla (eyeball it depending on the diameter of your tortillas). Sprinkle a bit of cheese evenly over the filling and roll burrito closed. *to roll, fold edge of tortilla closest to you over filling, then each side. Begin rolling away from yourself, using your hands to bring the left and right edges closed in a sort of bunched-up crescent. Dip your fingertips in some fresh water and wipe along remaining tortilla edge, then roll closed firmly. Pat burrito into shape, making sure the tortilla didn’t rip, no filling is going to leak out, and the bottom ‘seam’ is secure. -Place seam-side down in the hot (but not spitting) oil and fry for 1-2 min or until golden brown, then flip and repeat. Remove from the oil and place on a clean paper towel. -Repeat the previous 2 steps until you’ve run out of filling or tortillas; I usually have leftover filling myself, which goes in the fridge for a quick lunch or snack. -Once cool, any remaining burritos can be stored in an airtight bag or container in the freezer. One of my favorite family recipes is kuchen, a coffee cake-style breakfast treat dotted with blueberries. This is a no-fail recipe that can brighten up even the chilliest February mornings! -Cream ¼ C. butter/margarine with the ¾ C. sugar. -Add baking powder, salt and flax egg; combine. -Add the flour and combine. -Combine the nut milk and vanilla, then add to the batter and mix until smooth. -In a separate bowl, combine the brown sugar, flour, chopped nuts, cinnamon and melted butter. It should clump up around the nuts. -Grease your 8”x8” pan with more butter and then spoon half of the batter in relatively evenly. -Spread half of the topping and half of the blueberries on top of the batter. -Repeat with remaining batter, topping and blueberries. -Bake for 30 min or until the top is golden brown and a toothpick comes away clean. -Remove from the oven and let cool for 10 min before serving.